Why do we buy what we buy? To gain compassion or camaraderie with other people? Is buying an experience any more important than buying an object? You only have the one experience, whereas you can interact with the object multiple times… What about concert shirts that might only be good to wear a few times before they become too worn? What if we just buy something because of convenience, it was on sale, or, clever? What if the shiny object just distracts us from our norm? As I’m ramping up to either pack up to keep or sell/donate all my collections I never thought I’d have to move, the appeal of buying new things has greatly diminished, but there is the occasional item that still catches my eye. Coffee with Arch Enemy branding was too expensive but some from a band I’d never really listened to with some fun branding that implies the coffee is literally the waste of a municipality? It’s amusing enough and I needed coffee. How long will I keep the packaging? How long do we keep anything, really? For physical objects, maybe for as long as they have some sort of value. We don’t often keep the tools that break, but if it’s got a story behind it, then we certainly might. What about when the stories fade? When our trips abroad fade from memory, we might even forget that we took them at all! Everything, to a certain degree, is ephemeral. Everything we could ever do/own, and ourselves, we’re only here all too briefly. So why do we do the things we do? Probably for pleasure. Whether it’s a short-term pleasure, like purchasing silly coffee for a joke that also fulfills a convenience need, or delaying gratification for some kind of assumed long-term pleasure, we are deciding during every minute of every day to do one thing or another. We could decide to do laundry during a sub-optimal moment or exercise when our bodies are at their most ready to exert themselves. Or we could leave the laundry for another day and sit around. Everything eventually goes away anyways. Why not buy the silly coffee, the concert shirt of the band you like, the CD or record you might not listen to “enough” to consider worth spending the money to some? Why not go to the show? Take the day to explore a new town or study a new concept? While it’s good to not be overly-indulgent or wasteful, perhaps sometimes it’s alright to splurge on some sort of item. This essay has turned out weird. I’m not justifying to myself why I bought some expensive coffee, nor am I intentionally advertising it. Maybe I’m just on an artistic and design kick? Or maybe I’ve been focused too much lately on writing precisely about proper events and wanted to write something lower quality? No. I needed to explore this thought: why do I buy what I buy? I buy items that seem to richen something. 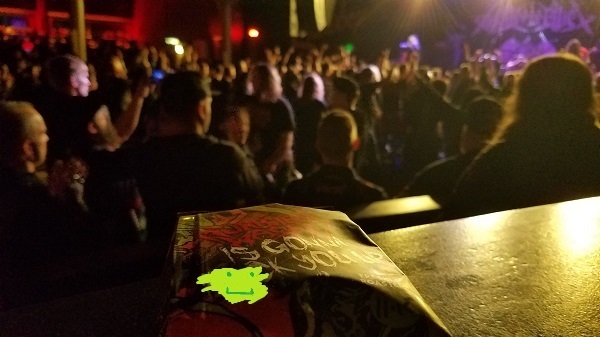 Inspirations: I was talking with Keyboard Chris, from the Keyboard Kommander team, about concert swag last night and the title popped into my head between sets. I kept up with the essay today through a brute-force determination to figure out why I own so much stuff. The concluding sentence does summarize that for me decently well. Maybe it’s time to shift the priority of expectation toward ownership of objects to experiences/wealth? Photo: Concert with the nefarious swag.